This impressive Italian-built luxury cruiser is unrivalled in comfort and performance. It is rare to find a 48 foot vessel with accommodation for 6 – 8, two full heads and a huge saloon. Also boasting dual station controls for those uncomfortable journeys, you will never be bothered by the conditions at hand. 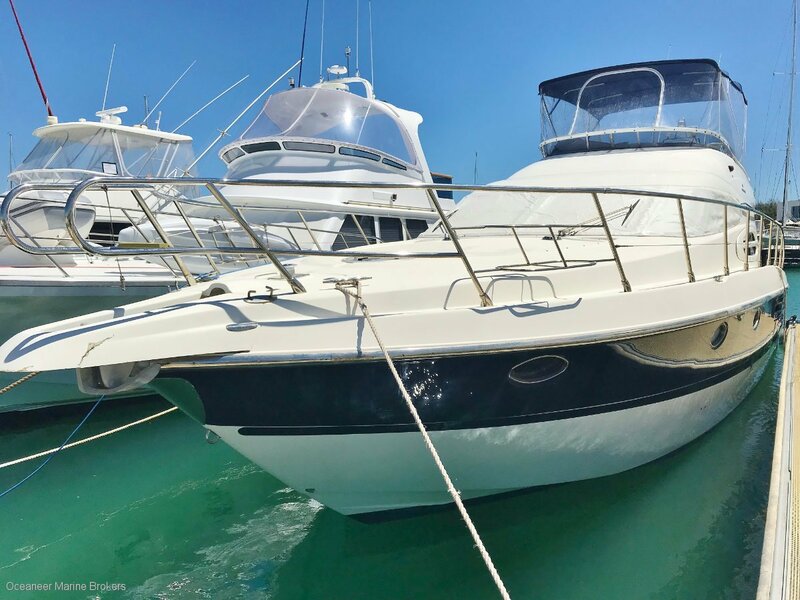 At an impressive price point, come have a look for yourself and see why the Cranchi name lives up to the competitors in the luxury motor yacht market. The Atlantique 48 is a new three-stateroom, two-head yacht from the famed Italian yard Cranchi. She's the next step up from the earlier A40 and offers distinctive styling, fine Italian craftsmanship, and a long list of standard features at a surprisingly affordable price point. Key features here include an electrically operated Bezanzoni gang way for easy off-loading and dinghy lifting. Chilled-water air conditioning (usually only seen on megayachts) is also standard, as are upper and lower helm stations. The engineering and wiring "behind the scenes" on this yacht are excellent. The only way to produce a top-of-the-line 50-footer for less than $600,000 is to have an extremely efficient workforce, and that's the secret behind the Cranchi line. The A48 has high quality materials expected in a vessel of this benchmark; stainless steel-framed companionway doors with smoked glass; custom joinery work and dining table; seamless headliners and flawless interior doors; stainless steel bow rails, and even an anodized aluminium engine bed mounted atop the stringers for maximum weight distribution and minimum vibration. Upon sea trial, the Atlantique handles more like a sports car than a motoryacht, shouldering into turns and carving through them with ease. And by using the right sequence of throttle commands (and a little help from the standard bow thruster) you can ease the A48 into the tightest of slips with just a few quick pops on the Volvo Penta electronic controls. Unlike many controls, by the way, these have strong detents for forward and reverse idle, so you always know where you are when docking, and believe it or not, you can see the transom from the flying bridge helm by looking down the f/b stairway aft, another nice touch when tying up after a long day on the water. In summary, the A48 offers Italian craftsmanship and styling for discriminating luxury yacht buyers. Contact Oceaneer Marine Brokers for further information.